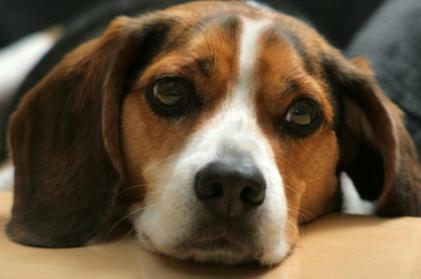 Issue: What Causes Dog's Snorting Spells? Hi,I'm having a problem with my two-year-old Beagle mix. Every now and then she starts frantically licking everything. She'll also try to eat grass or strings hanging off her toys. After all this she'll vomits white mucus. While she's doing all of this she will snort and swallow as if she's got drainage in her throat. This can go on for hours. I've taken her to two different vets to no avail. No one can seem to figure out what's wrong. Her lungs look good on X-ray, and her heart sounds good so is it possible this could be a sinus issue? She eats and drinks normally. When she's not having these episodes (they've been happening every couple of days for the past two weeks) she's rough housing normally with our other Beagle. The snorting and swallowing really does seem like a mucous issue, but whether this is completely due to bad sinus or if your dog has an allergic reaction to something I just can't say. What I'd like you to do is keep a notebook diary, marking down every time she has these incidents. Then I want you to think back and remember what she was doing for the last 30 minutes prior to the episode. Do this for at least two weeks, and it may reveal what's triggering all the licking and snorting. Even if it doesn't, it will drive home the fact to your vet that these episodes are frequent and real, and they must have a cause. Hopefully this will lead to a diagnosis. In the meantime, there is a way you can help her when she's having a snorting spell. Take hold of her and close her nostrils with your fingers. This will trigger an automatic response to open her mouth and lick, and then close it and swallow. I used to use this trick on snorting Shih Tzus in the ring, and it worked rather well. Hopefully it will help your dog too. Thanks for your question, and I hope your vet can figure out what's going on.